Welcome. I’m not quite ready for regular postings yet, but you’re welcome to snoop around while I set up the site. After I return from the Polaris Users’ Group conference next week, I’ll launch this blog for good. My plan is to use this blog to follow the course of social software in general and its value to libraries specifically. I’m the system trainer at a large public library system in the Pacific Northwest, a social web participant, and an avid reader. I hope I can marshall all those hats into an interesting blog. The two postings just below this one link to recent articles I’ve written elsewhere. Why call it “Library Stream”? It has to do with the flow of ideas. I suppose there’s a kinship to Flickr’s “photostream” and technology’s “streaming” audio & video, too. 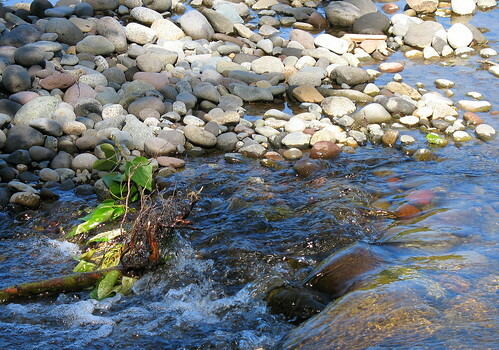 But there’s one more thought the “Library Stream” name conjures up for me. It’s the idea that change has become so common in the modern library that — like a stream — you’ll never set foot in the same library twice. Please visit again. I hope to swap stories with you in the future. 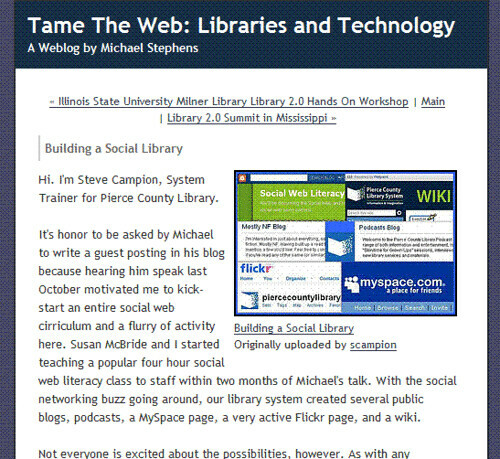 As I a warm-up lap for the long-distance effort of writing a library-related blog like this, it might be good to connect to a guest blog that I wrote for Michael Stephens earlier this summer: Building a Social Library.